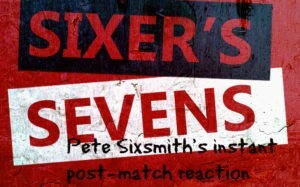 You are here: Home › Sixer's Sevens › Sixer's Sevens 2017-2018 › Sixer’s sevens: Middlesbrough take one point. Do our players get another? We were 1-0 up when I started setting this up, just after half time. By the time I’d got the page ready for Pete Sixsmith we were 1-2 down, with the second being a Grant Leadbitter penalty. Could we overcome being struck by the curse of the former player? Yes and no. Yes because we scored to equalise but no because they scored a third shortly afterwards. 17 February 2018 Sunderland 0 (0) Brentford 2 (2) Gets worse by the week. Relegation certs. November 5 Middlesbrough 1 (1) Sunderland 0 (0) Bottom of the league and deservedly so. October 28 Sunderland 1 (1) Bristol City 2 (1) Hopeless and clueless. Add embarrassing to that. Sixer’s Middlesbrough Soapbox: fighting spirit, last minute equaliser. Better than nowt?